Elk drop their antlers in the spring, and grow new ones. I confess, I did not know this. Another thing I did not know is that, apparently, they grow back quite quickly in time for spring – about 1″ per day. That seems to be a ridiculous way of doing things, but I suppose evolutionary psychologists can explain why elk choose to do things that way. Thursday morning, the elk was down to one antler. I am ignorant of elk, so I called my neighbor Bob, who is an old woodsman who spends a lot of time on my property watching the bobcats, deer, and whatnot. One of the other things I love about Bob is that he’s not big on florid, unnecessarily verbose explanations, though he always thoughtfully and precisely answers questions. Bob asked if I minded if he’d search for it and naturally I said to be my guest. I have a policy, which is generally if someone actually asks me permission to do something on my property, I say yes. Bob is, basically, the only person who has figured that out in 15 years. The next morning I pointed out where the elk had been hanging out, and Bob and his wife, Sharon, and their dog, began exploring about. I could tell he was getting frustrated when I called him this morning to tell him the elk had dropped its other antler. Then I headed over to the shop for a few hours and, when I got back, I had a message on my phone: he’d found both of the antlers; would I like to see them? It turned out that Sharon had suggested he take the dog, and he came up through the property using one of the side roads (it’s not really a road, it’s more of a directional mud-puddle) through the mine tailings, and one of the antlers was sitting right in the path. He got out and the dog pointed out the other one right away. Bob’s a gracious fellow and credited the dog with finding the antlers; see why I like Bob? Anyone who treats their dog with respect immediately earns some credit with me. I kind of feel like evolution played a joke on the elk. Those great big things are just for whacking into other elk so they can establish a proper hierarchy of elkness. What does this do to the psychology of elks? Are the elk on the bottom of the antler racket resigned to their fate, or are they entitled and bitter? Apparently you can get polyurethane fake skull things that you can drill and screw the antlers through from behind, then mount them on your wall in your man-cave. To me, it looks like they might cause the wall to fall in. The material they’re made of is surprisingly dense and (given that they’re weapons) quite strong and heavy. The growth plates where they attach to/grow from the skull are pretty nifty looking. Maybe they grow new antlers because the old ones are worn out and run the risk of breaking if reused for another season? All that headbutting is bound to leave a mark. But it might equally well be a fashion statement: Down curves are so last year, so everyone’s growing outwards curves this season. Out is in. 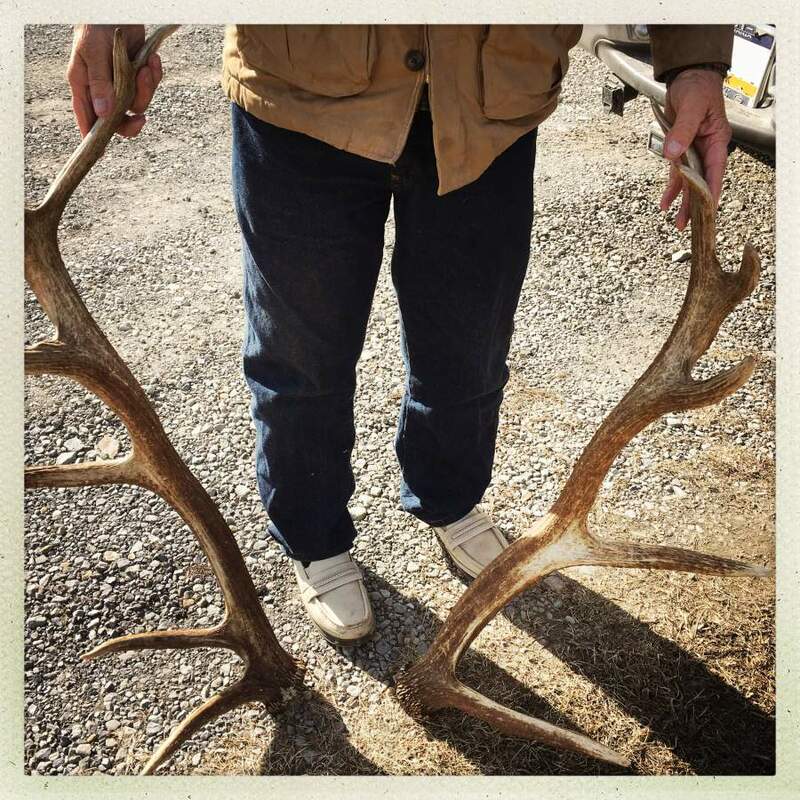 They shed their antlers once they’ve surved their purpose for the year. They’re a method of sizing up the strength and fitness of rival stags – a stag with smaller antlers will not usually fight a better-endowed stag for control of and access to the females. Once mating season is over and the females no longer receptive there is no reason to fight, so there’s no point in carrying such heavy adornments. They’re no longer worth the expenditure of energy required to carry them, and they also impede the stags progress through dense woodland, making them more vulnerable to predation. My guess is that as a male elk matures, its antlers get bigger, year by year. Once one of the young male deer in Nara allowed my girlfriend and me to touch its new antlers. To my surprise, they were covered with skin and fur. Maybe that came off later, I don’t know. They were also quite warm, from the blood flow, I guess. Surely by the time they come off they have no supply of blood. I’ve always liked wood. For one thing, the smell of grinding bone or antler is pretty disgusting. They grow new antlers every year because the 2nd amendment says they can! I too was unaware of the yearly changes. Do you know if each elk antler has a distinct pattern that repeats itself every year? Or is each year different? Each year is different… young animals are “spikes” because they don’t have any of the branches in the antlers yet, that would be in their second year. Each year, as they get older and bigger, they have more branches on the antlers so that by the time they are 7 years old the antlers can be quite big. Another factor is how much they can find to eat – the antlers can weigh as much as 40 pounds. (!!!) They can also grow as fast as 1″ per day!!! I suppose all that shows the fitness of the animal. Animals that have horns (like goats) do not shed the horns. They are a part of the animal for life. Cutting off the horns of a fully grown adult goat can cause it to bleed to death. The soft skin does rub off once the antlers are fully grown. You can see why our ancestors found anlters such a useful material, apart from obvious things like handles and toggles or buttons they were used as picks. When excavating chalk pits that were originally dug for flints archaeologists found picks in situ, usually at the end of tunnels, possibly placed to symbolically close that tunnel. The pattern of mining was to dig a large pit straight down, then to dig short side tunnels. When the elk first gets its antlers, they are covered with skin and fur, its called ‘being in velvet’. Once the antler reaches its length and girth and gets its tines growing the velvet starts to itch, and you can see the elk rubbing on tree branches and small shrubs to get the velvet off. I too found it very cool to feel it on an elk. The reason your neighbor commented on the antlers being in good shape is because once they fall off, mice and other small animals will eat the antlers for the calcium they contain. Same with deer antlers. Very nice set. There are places that will pay for antlers in that kind of condition. My dogs love chewing on antlers. They’re sawed into pieces first. I can’t help but wonder if they’re a risk of wearing their teeth away. Do you know if each elk antler has a distinct pattern that repeats itself every year? Or is each year different? Bob says that they grow more points and larger over subsequent years. That would make sense, since the bigger, grander-antlered elk has demonstrated its ability to survive longer, therefore feminism is wrong and evolutionary psychology is true. Post modernism is destroying cultural marxism; even the elk have no freedom of speech anymore. I tried but I cannot make the results of my goooogling come here. Elderly male members of the British Establishment have a similar thing with their eyebrows. By the time they’re in their eighties they could give most stags pause for thought. I think the current leaders of the hierarchy are Rowan Williams, the former Archbishop of Canterbury, and Sir Bernard Ingham. Antler is an incredibly versatile material, but it’s pretty hard to work. It’s tougher and more flexible than bone. Composite antler combs are one the the classic Viking artefacts. I stopped giving my dogs antlers as I thought they were damaging their teeth. Some vets advise against antlers as chews because there is also a chipping risk. Mind I could be wrong about what damaged my boy’s teeth given that he will play with stones, but he doesn’t chew them so I’m inclined to blame the antlers for him losing the tips of his canines. Cartomancer @ #15 my dad’s eyebrows went that way, one growing up, the other down so that if left untrimmed (which he often did) you couldn’t see his right eye at all. I don’t know how long mine would grow if left to themselves and have no intention of finding out. Eeeek, well, I went and did that search and now it’s gone and ruined my breakfast. Those look good. I never had the opportunity to work with antler but I would love to get my hands on some for knife hanles. I worked with bone and I do not mind the smell – I am wearing respirator all the time because of the cancerous dust it produces anyway. The way I remember it, the antlers are shed and grown anew because they cannot grow anymore once the velvet peels off. And the size and ammount of spikes on the antler are the actual signs of fitness of a given animal, especially the health of their testicles. For example bucks with damaged, underdeveloped or otherwise sick testicles will grow abnormally formed or strangely assymetrical antlers. AFAIK in CZ the gamekeepers are obliged to shoot such animals, because the abnormal antlers are a sure sign of low fitness and their trophies are actually valued. Nice set. The get larger as the elk gets older. I’ve seen some that were filling the back of a pickup. Around here they are collected in the spring and sold to dealers as decor, knife handles and other things. You walk along the ravines where the elk travel and look for antler-shaped objects.